PS4 version reviewed. 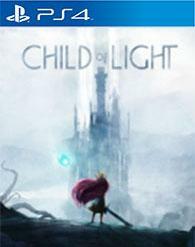 'Child of Light' is one of the first games to be marred by the new publisher enabled watermarks in Sony's Share system. Ubisoft, coming off the critical success of 'Rayman Origins' and 'Rayman Legends,' seeks to kick the can down in the road of beautifully hand-drawn animation and quirky gameplay. Under the newly dubbed UbiArt Framework engine, 'Child of Light' is born. 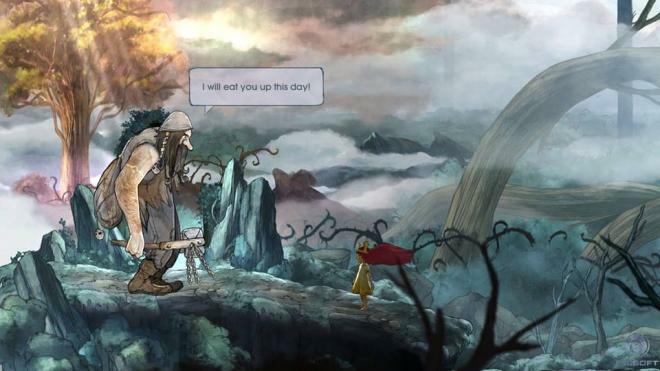 A tactical, turn-based RPG with 2D exploration, 'Child of Light' will wow anyone at first glance, and might just be the beginning of Ubisoft's devotion to smaller, more innovative titles. Indie studios should be shaking in their boots. There was a period of time when video games, young and growing, surged rampantly forward in technological innovation. Mostly it was an awe inspiring collection of decades, when every game seemed to outdo the last in visual fidelity and graphical prowess. But something was always missing. Gamers wanted to see games become more than a standpoint of computing power. They wanted art. 'Child of Light' tries to do the art thing first and the game thing second, but what we surprisingly get somewhat the reverse. Had it crashed onto the scene alongside such vibrant importance as artsy titles like 'Limbo' and 'Braid,' Ubisoft's latest might've bypassed the scrutiny we hold today. But we're past that jump now, we don't crave the simple inclusion of artistic intent in a video game. Now, we've finally reached the point where quality of artistic execution is just as important. 'Child of Light' doesn't hold up on that front. Ubisoft didn't quite sneak in their art-first game before the real critics arose and held games to a higher standard. As a turn-based combat RPG, though, it's far more innovative, far more entertaining. But let's start with the letdown so we can come away with a smile in the end. Despite how utterly striking the game's visuals can be, from the dreamy opening cutscene to the dreary land of Lemuria, the thematic and dramatic ambitions, which are meant to be a powerful and commonly desperate-feeling fairy tale, are no more than a failure. And that failure can be attributed almost entirely to the writing, which relies on an unbearable game-wide gimmick that overstays its welcome in the first hour. Ubisoft's go-to writer, Jeffrey Yohalem, decided to rhyme his way through the entire tale, forcing one word after another like a baby taking his first steps. At its best the rhymes are serviceable. At its worst, however, I cringed in all of my body while I watched that baby teeter towards a harrowing stairway, helpless to my own helplessness. I couldn't take it. No matter what was being said, the point was lost in favor of forced, cheesy and childish poetry, all confounded in the futile desire to grant the game a sense of matriarchal wisdom a mother might pass to her children as they fall asleep. But these are the words of an amateur, a poem constructed in service of virtual combat, a studio far outreaching its narrative depth. The actual gameplay, on the other hand, despite being pervaded by the terrible writing, is a mostly traditional mix of two-dimensional exploration and turn-based JRPG combat, the latter complicated with a few compelling twists. Young hero Aurora awakens in the strange land of Lemuria, seeking a path back to her loving father, he himself fallen ill in despair. Along this path you'll evade minor obstacles, solve minor door-switch puzzles and collect goodies in chests, but the real brunt of the gameplay arises when you come into contact with a patrolling enemy. Warped into a familiar standoff battle arena, Aurora and any number of her sidekicks stand against a wide variety of foes as they take turns striking blows, utilizing all combinations of attacks, buffs and spells. 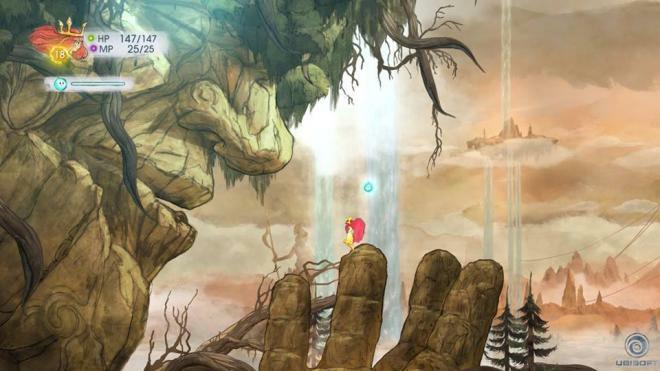 The real twist, arguably the only reason 'Child of Light' should exist, is at the bottom of the screen. A timeline shows icons for every active character as they approach their turn to cast, the game freezing when it's up to the player to choose an attack. Once an attack, or more passive action, is chosen, that character then must complete that action in the allotted red casting section of the timeline. Some attacks take longer than others to complete. Here's the thing. If a character is struck during his or her time in the red casting zone, then that character is interrupted, doesn't get to complete the action, and must reset on the timeline. Everything you do is to avoid being interrupted or to do the interrupting yourself. Every action you take either takes advantage of that timeline or falls victim to it. You even have a sidekick named Igniculus who can slow down enemies at your will, giving you the advantage of ultimate temporal control. His ability is tempered by limited use. The system is both strategic and tactically exciting, as choosing more powerful, but slower, spells often leads to a tantalizing run-up in the casting zone, your palm sweating in anticipation of a successful interrupt. You dash Igniculus from enemy to enemy, trying to time everybody's attack up perfectly, often failing, but bouncing back in your next attack with renewed poise. As the game progresses and you earn new sidekicks and new attacks, your strategy blossoms into a juggling act of attacking, defending (which has the advantage of being instantaneous) and swapping out active slots with the most effective character at the time (only two characters are active at once). That you can do this instantaneously as well means there's never any reason not to seek the strongest candidate for the given collection of enemies. The dwarf,a spell-casting powerhouse, can strike a deadly blow against elementally vulnerable foes. A guardian taunts enemies and takes the hits while Aurora casts widespread light attacks. An odd mouse can speed up friends and slow down foes. Everything else RPG in the game, though, comes off just as forced as the poetry. A gem-augmentation system, herein called Occuli, is both rudimentary and excessive. Lesser gems grant characters a variety of boosts, while combining those gems can grant you rarer, more powerful augmentations. The simple crafting of new gems is fine, but the system is brought down by a cumbersome menu system and the game's overreliance on gems as your primary loot. It becomes a chore. Not as bad is the leveling system, which is so straightforward it seems unnecessary. You choose a branch on a skill tree then level up any of the characters in that direction, then choose another branch once you're reached your goal. It might've been automated had Ubisoft not sought justifications for calling this game an RPG. The developer could take some lessons from the riotously simple 'Mario and Luigi' games out of Nintendo. Yes, the game is gorgeous. 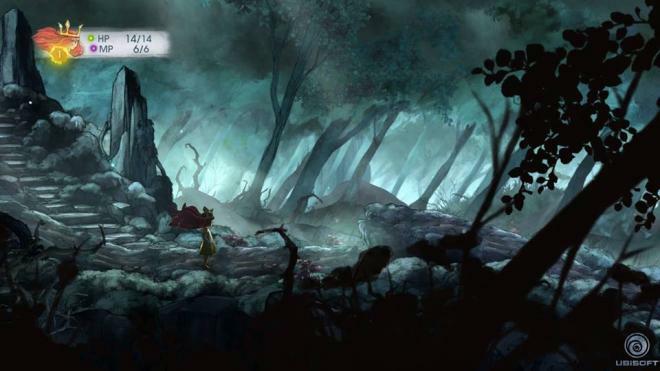 Hand-drawn games often are, but with 'Child of Light' there's a certain water-color quality to the environments and characters that will forever keep it separate from the pack. However, and this is a big however, there seems to be no ambition beyond making it pretty. There's no depth to the world, no memorable theming or construction. It's all so utterly beautiful that I can't tell any of it apart. Nobody sat down and decided what the point of 'Child of Light' was going to be, other than that it should blow people away. It does, but not in a memorable kind of way. Lemuria isn't so much a setting as a clever name for a setting. Aurora, despite her flowing red hair, is just a hero for hero's sake. The villain is villainous because that's what villains do. These issues might seem unconnected to the visuals, and I do attribute them in part to the lackluster writing. But the other side of that coin is the lack of confident visual direction. There's simply no sense of place and subsequently no sense of story. A couple sad and somber tunes hint at some deeper meaning to the story. Aurora sometimes whips out a flute to cheer up her friends. The piano's uncanny ability to reflect a darkened horizon and light onslaught of endless rain sometimes even distracted me from the words carelessly flung about. I wish this story was told in song. Alas, it was not. What limited voice acting existed did the job, and even elevated the poetry from heart-crushing to just heart-squeezing. Perhaps leveling characters in a different direction or exploring places you didn't the first time through are just enough to justify a second playthrough. The combat is certainly entertaining enough to sustain it. Other than that, this 10 to 12 hour story is a one-and-done. A second player can take control of Igniculus and join in on the fun. This is great for teaming up with very casual/novice players.